The term template, when used in the context of word processing software, refers to a sample document that has already some details in place; those can be added, removed or changed either by hand or through an automated iterative process, such as with a software assistant. Once the template is completed, the user can edit, save and manage the result as an ordinary word processing document. Using Google forms you can plan events, make a survey or poll, give a quiz, or collect other information in an easy, streamlined way. 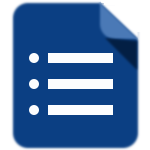 You can create a form from Google Drive or from an existing spreadsheet that can record the responses to your form. Here we have created free form templates in various categories using Google forms. You may easily select your own (ask to share) and update according to your needs. Publish the form as a standalone page or insert it into your website page.